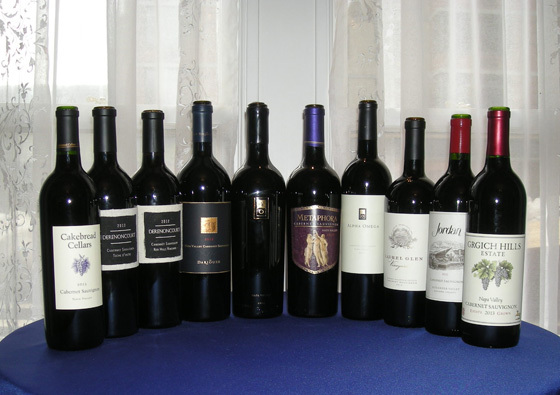 The Fifty Best held a “blind” tasting of 11 recent release California cabernet sauvignon wines priced at $50 and over, with 15 pre-qualified wine judges. Strict tasting rules were applied. The order of service was established beforehand by lottery. Each of the wines were poured into fresh glasses from new sealed bottles. Only ice water and crusty white peasant bread were available to cleanse the palate. The judges wrote down their impressions of each wine on score sheets. The scoring was done on a 5-point system, with 5 as the best. Double-Gold and Gold are awarded according to a set range of final point scores received from the judges. Indicative of the high quality of the wines in this tasting, there were no silver or bronze medals awarded. To produce this 100% Cabernet Sauvignon, grapes from the Ink Grade Vineyard on Howell Mountain were totally barrel fermented and aged in 100% new French oak for 18 months prior to bottling. Aroma: Cherry, black cherry, currant, ripe plums, cassis, blueberry, vanilla, chocolate, mocha, sweet violet, sassafras, mint, licorice, peppery, black pepper, tobacco, Serrano ham, barnyard, earthy, black tar, mineral, oak, wood. Palate: Black cherry, cassis, plum, big dark red fruits, fleshy black fruits, grape, very herbal, green bell pepper, black and white peppercorn, vanilla, creamy, cocoa, licorice, pencil lead, woody, oak, earthy, tannic, balance of fruit-oak-tannin-acidity. Finish: Cherry, plum, concentrated berries, tobacco, leather, tart, strong tannins, opulent. Grapes for this wine were sourced from Darioush Estate in Napa Valley, Mt. Veder as well as Oak Knoll and hillside vineyards throughout Napa Valley. Following fermentation, the wine was aged in French oak (85% new) for 22 months prior to bottling. Aroma: Black cherry, cherry, blackberry, raspberry, blueberry, cranberry, cassis, prune, tobacco leaf, licorice, cocoa, sweet and sour notes, sweet earth, woody, pleasant. Palate: Black cherry, cherry, raspberry, blackberry, cassis, up-ripened plum, apple skin, raisin, vanilla, eucalyptus, bell pepper skin, oak, smooth, balanced fruit and tannins, good acidity, should mature nicely, easy-drinking. Finish: Plum, vanilla, spice, oak, smoky, round, medium tannins, well-balanced, long on the fruit flavors, good aging potential, elegant. Hand-picked, hand-sorted grapes (76% Cabernet Sauvignon, 19% Merlot, 3% Petit Verdot, 2% Cabernet Franc) for this wine hailed from Windfall Vineyard and Komes Vineyard (in Rutherford). Following fermentation, the wine was aged for 20 months in a combination of new and used French oak, and bottled without fining. Aroma: Blackberry, cassis, blueberry, apple, lavender, green pepper, black olives, sassafras, spice, licorice, mint, peppermint leaf, savory herbal notes, a grassy field, moss, earth, mineral, wet rocks, woody, oak. Palate: Dark berries, black currant, cassis, prune, vanilla, bell pepper, grassy, minty, peppermint, spice, cracked black peppercorn, licorice, graphite, tobacco, oak, wood, slightly smoky, high acidity, slight tannin. Finish: Black cherry, cherry, vanilla, licorice, leathery, earthy, mineral, oak, lots of tannin, sweet tannins, completely unique. This wine was made from a blend of Cabernet Sauvignon (79%), Cabernet Franc (14%), Petit Verdot 6%) and Merlot (1%) harvested from 9 different Napa Valley vineyards. Fermentation was half in barrels and half in stainless steel tanks, with aging in French oak (70% new) for 22 months before bottling. Aroma: Black cherry, blueberry, black currant, ripe plum, big robust fruit, blackberry jam, vanilla, lots of herbs, eucalyptus, licorice, grass, distressed leather. cedar, oak, old wood, cocoa, earthy, pleasant. Palate: Ripe cherry, black cherry, blackberry, black currant, cassis, apple skin, raisin, vanilla, milk chocolate, spicy, tobacco, oak, strong tannins, smooth, nice balance. Finish: Black cherry, cherry, black currant, mint, spice, tobacco, tannic, round, pleasant. This wine was made from predominately Cabernet Sauvignon (96%) and a small amount of Cabernet Franc (4%), with grapes harvested from five separate Napa Valley Vineyards. The wine was totally barrel fermented, aged for 22 months in French oak barrels (80% new) and bottled without fining or filtering. Aroma: Black cherry, dark berry, cassis, apricot, raisin, vanilla, hint of cream, chocolate, black olives, mint, black pepper, light licorice, perfume, forest leaves, garden, oak, bready, earthy, leather. Palate: Cherry, tart un-ripened cherries, blackberry, black currant, cassis, plum, prune, un-ripened white peach, vanilla, almond, spice, black pepper, licorice, tobacco, leather, crushed rock, oak, decent balance, firm tannins, nice ratio of fruit and acidity. Finish: Chocolate, mint, anise, tobacco, medium oak, earthy, slightly tart, complex, balanced, soft undertones, soft tannins, mouth-filling, mouth-watering, sits very well on palate. “Certified organic” grapes (79% Cabernet Sauvignon, 12% Merlot, 5% Petit Verdot, 4% Cabernet Franc) from vineyards in Yountville, Rutherford and Calistoga were used to make this wine. Following fermentation, using indigenous yeasts the wine was aged for 21 months in French oak (60% new) before bottling. Aroma: Black cherry, cassis, raspberry, green apple, vanilla, Baker’s chocolate, cola, floral, lilies, fresh-cut flowers, mint, tobacco, leather, slight earthiness, cedar, oak, smoky. Palate: Blackberry, black currant, cherry, raspberry, cassis, prune, plum jam, vanilla, chocolate, black olives, licorice, leather, graphite, mineral, oak, cedar, sweet tannin balanced with oak. Finish: Cassis, raisin, vanilla, grape skin, spicy, peppery, dry oak, woody, hint of tannin. Hand-picked hand-sorted grapes for this wine were sourced from Stagecoach Vineyard on Atlas Peak, and following whole-cluster fermentation the wine was aged in French oak barrels. Aroma: Black cherry, cherry pie, currant, ripe plum, raspberry, cassis, sour blackberry, blueberry skin, raisin, vanilla, dark chocolate, mocha, Baker’s chocolate, licorice, mint, cinnamon, leather, must, smoke, pleasant. Palate: Cherry, black cherry, black currant, currants, blackberry, unripe strawberries, jammy apple skin, cassis, eucalyptus, spice, black pepper, balsamic, nice balance of fruit and tannins, sits on the palate very nicely, should mature nicely. Finish: Cassis, vanilla, tobacco, toasted oak, tannic, slightly tart, soft, well-balanced, elegant. Separate lots of this blend (83% Cabernet Sauvignon, 9% Merlot, 5% Cabernet Franc, 3% Petit Verdot) were individually fermented and aged in French oak (60% new), and the final blend was aged for another 12 months in French oak (60% new) before bottling. Aroma: Bing cherry, black cherry, cherry, black currant, red currant, pomegranate, strawberry, blueberry jam, vanilla, bell pepper, green bell pepper, cinnamon, leather, chalk, flint, mineral, smoke, earthy, slightly dusty, toasted oak. Palate: Black cherry, cherry, black currant, red berry, blackberry, strawberry, pomegranate, cassis, vanilla, watermelon rind, eucalyptus, touch of coffee, graphite, cedar, oak, good integration of fruit, silky. Finish: Cherry, toasted sweetness, spicy, slightly tart, oak, smoky, hint of tannin, balanced, soft. This wine is fashioned from grapes (77% Cabernet Sauvignon, 16% Merlot, 5% Petit Verdot, 2% Malbec) sourced from the Jordan Estate in Alexander Valley as well as vineyards in Mendocino County and Dry Creek Valley. Following fermentation, the wine was aged as individual lots in new and used French (69%) and American oak barrels for 12 months, after which the “master blend” was assembled. The wine was filtered and fined before bottling. Palate: Cherry, Bing cherry, ripe berries, strawberry, cassis, currant, plum, sweet grape, vanilla, violet, spices, licorice, balsamic, flint, light oak, smooth, nice balance, high acidity, should mature nicely. Finish: Cherry, raisin, floral, aromatic, tart, very bright acidity, deep, round, soft, mellow, lush, elegant. The grapes for this 100% Cabernet Sauvignon were from a vineyard featuring obsidian and gravel soils. Following barrel fermentation, the wine was aged in French oak (50% new) for 18 months before bottling. To make this wine, 100% estate grown cabernet sauvignon grapes were fermented and aged in French oak (55% new). Aroma: Black cherry, cherry, blackberry, black currant, cassis, blueberry, cranberry, raspberry, red apple, violet, green bell pepper, toasted almond, oak, cocoa, flint, fresh, clean. Palate: Cherry, dark cherries, red currant, black currant, blueberry, bright raspberry, plum upfront, vanilla, eucalyptus, bell pepper, black pepper, leather, cigar box, heavy oak, plump fleshy sweet tannins, good concentration. Finish: Strawberry, pepper skins, light oak, graphite, tannic, clean, bright, round, soft.